LG G5 was announced a few days ago with a big pomp at Mobile World Congress in Barcelona. The company announced today that the Smartphone will come to India in the second quarter of this year followed by the worldwide launch in April. To recall, the device sports a 5.3 (2560 x 1440) Quad HD Quantum display using which you can view the notifications, battery status and time without having to wake up the phone. Only one small part of the display is lit all the time, so hardly 0.8 percent of the battery drains in an hour for it. 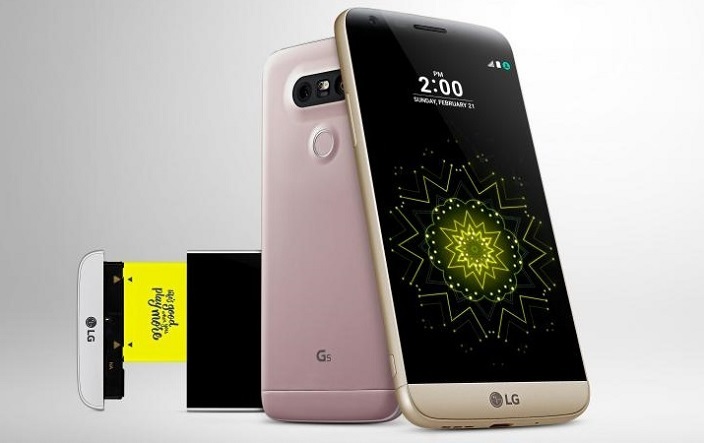 LG G5 is powered by a processor of Quad-core Qualcomm Snapdragon 820 and runs on Android 6.0 Marshmallow. The device has a 16 MP with manual mode, Laser auto focus, OIS 2.0 and LED flash while the Selfie Camera can be used to take pictures at a maximum resolution of 8 MP with 135-degree wide angle lens. The device has a battery of 2800mAh and will be available in Pink, Gold, Titan and Silver colors. Let us know in your comments on whether LG G5 has met your expectations. Also Read: It is official now, LG announced LG G5.